creates a unique romantic journey. Our selection of stand-out activities and pursuits are specially designed to share and indulge as a couple while exploring this magical country together – ultimately creating long-lasting memories. Ho Chi Minh City is Vietnam’s largest metropolis. 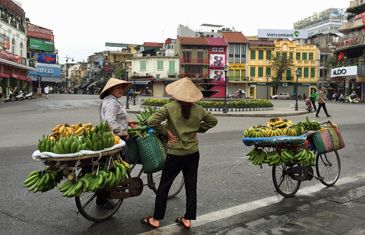 Despite rapid developments, the former Saigon is a mesmerizing backdrop to momentous history. Your city tour takes-in key historical landmarks and magnificent 19th century French colonial architecture. Late afternoon, embark on a romantic sunset cruise along the Saigon River, aboard a boutique-style vessel inspired by 1920s-era Indochinese riverboats. Sipping on cocktails or a glass of fine wine, glide past a fascinating contrast of historic and modern buildings as the sun fades away. These run from the Pont des Messageries Maritimes, designed by Gustave Eiffel, to iconic Bitexco Tower, at 262.5m (861ft), the city’s tallest building. The southern Mekong Delta is a sprawling region of intensively cultivated land dominated by – and dependent on – the Mekong River. The Delta’s ‘Rice Bowl’ picturesque landscape reveals verdant rice paddies, coconut groves and fruit orchards. We visit a small cottage industry to see how a typical snack, sticky rice wrapped in coconut leaves, is made using age-old techniques. A motorboat cruise along one of countless waterways passes peaceful stilt-house communities and a bike ride through flat terrain ends-up at a local fruit orchard, where you sample just-plucked exotic fruits. Further exploration of the lush surroundings is by a romantic horse-drawn cart or tri-motorcycle, and sampan boat along a slender canal. At a century-old farmer’s home, a delicious lunch of ‘Delta’ specialties is served for you to share. 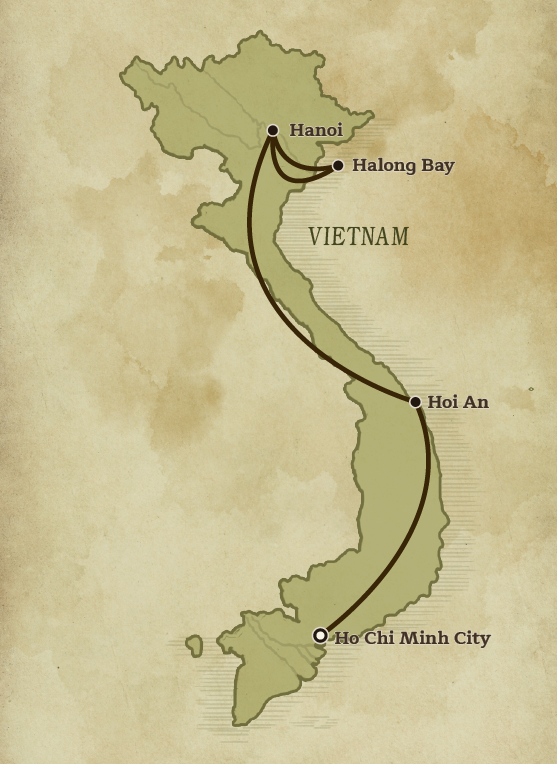 The ancient riverside town of Hoi An was a major ‘Silk Road’ trading port from the 16th to the 19th centuries. One of South-east Asia’s oldest towns, today Hoi An is a UNESCO World Heritage Site, popular for its well-preserved architecture, historical sites and antiquated ambiance. 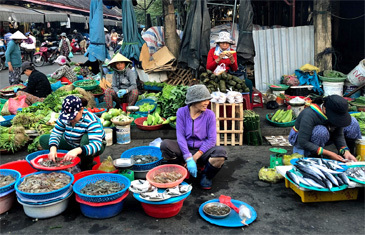 After a day exploring the town, head to Cam Thanh Village, nestled in peaceful countryside outside Hoi An, a riverside farming community that is a major supplier of seafood, and produce for the region. On a traditional basket boat, you will be magically transported to a moored, floating bamboo raft. Here, indulge in a romantic BBQ dinner a deux, dining as the sun sets and later, under starry skies. Take an early morning tour around Hoi An’s bustling riverside market. Your guide is chef-proprietor Duc Tran, from acclaimed Mango Restaurant, who imparts in-depth knowledge of the local culinary scene. Later, this talented chef will host an intimate hands-on cooking class at his boutique restaurant, followed by a sit-down lunch. With its narrow, pedestrianized streets running alongside Thu Bon River, Hoi An’s Ancient Town quarter is ideal for a guided tour on foot. Many of Hoi An’s atmospheric buildings are concentrated here, distinct for their fusion of Vietnamese, Chinese, Japanese and European architectural influences. Off Hoi An’s coastline, the Cham Islands comprises of a cluster of eight small islands, part of Cu Lao Cham Marine Park, a UNESCO-recognized World Biosphere Reserve. A private speedboat whisks you away to these naturally beautiful islands. Enjoy an idyllic day out enjoying crystal-clear turquoise waters, pristine beaches and rich marine environment. For a spot of culture, head to a traditional fishing village and Ong Ngu Temple, dedicated to whales and whale sharks, once abundant in these waters. Later, snorkel off picturesque Xep Beach, marvelling at some of the 135 species of soft and hard coral and teeming colourful fish. Relax at Chong Beach’s palm-fringed white sands and later, at a beachfront rustic restaurant, indulging in a succulent seafood lunch. In Vietnam’s north, the capital Hanoi ranks as one of Asia’s loveliest cities; despite increasing development, this ancient city still retains a unique charm and cultural traditions. 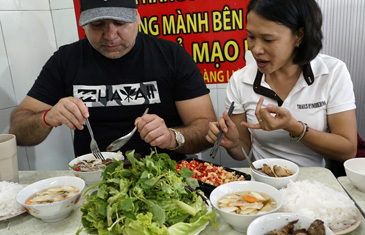 Hanoi street food is regarded as some of Asia’s finest and the best way to sample it, is local-style ‘on the street.’ Guided by a renowned food blogger, our bespoke street food tour covers Hanoi’s most authentic eateries. Strolling through the Old Quarter, you can sample local delicacies and learn about regional Vietnamese food. 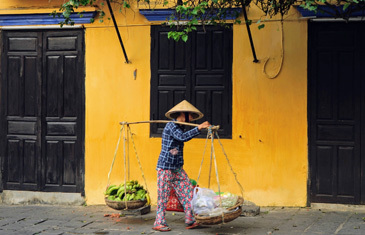 Our guided tour delves into Hanoi’s more hidden side, experiencing life of a local. Café culture is a huge part of Hanoi life. Thus, a visit to a streetside, vintage coffee shop is a must, sampling home-grown robust coffees and watching the world go by, just as locals do. Enroute, we pass St. Joseph’s Cathedral, one of the French Quarter’s oldest buildings and Hanoi’s only Gothic structure. Down Nha Chung alley, meet a Hanoian resident at his charming French Colonial-era home, who will regale you about Hanoi life, both past and present. The Red River Delta, a rural area surrounding the Red River, is characterized for its ancient pagodas, farming landscape and artisan villages. We drive to Duong Lam, a typically quaint agricultural village in the ‘Delta. Duong Lam stands-out however as the birthplace of two Vietnamese kings and the nation’s first village recognized by UNESCO for its Cultural Heritage Conservation. Duong Lam’s series of four centuries-old dwellings and narrow streets are the epitome of traditional northern Vietnam village life and architecture. Historical vestiges include Mong Phu Communal House, boasting a still-intact original entrance gate and 15th century Mia Pagoda, renowned for its 287 ancient statues. Our tour concludes at an ancient house, meeting the friendly family residents. Halong Bay, a UNESCO World Heritage Site, is one of Asia’s most magnificent natural splendours with over 1,600 largely uninhabited limestone islands jut out of the Gulf of Tonkin’s emerald green waters. This impossibly romantic seascape reveals grottoes, secluded coves, coral beaches and hidden lagoons. Meaning ‘Descending Dragon’, Halong Bay’s outstanding mythical beauty is complemented by major biological and geological significance. Cruise through the bay aboard Jasmine, our deluxe junk-style boat, stopping at leisure at several hidden caves and pearl farm villages.